Aspirin Pharmacology | All the Facts in Once Place! Aspirin Pharmacology | All the Facts in One Place! Also known as acetylsalicylic acid, aspirin has – in its various forms – been used for well over 2,500 years. It was only as recently as 1897, though, that a German company – Bayer – modified the original precursor of aspirin into a less harmful, more therapeutic alternative. It remains one of the most widely used medicines, with more than 40,000 tonnes (or up to 100 billion pills) produced each year. Aspirin is used to treat fever, pain and inflammation. It achieves this by suppressing production of pro-inflammatory prostaglandins and thromboxanes – suppression that occurs due to the drug’s irreversible binding to the COX enzyme. Acute coronary syndrome and acute ischemic stroke – mortality is reduced by aspirin’s ability to reduce platelet aggregation. Aspirin remains an increasingly important medicine in the clinician’s toolkit. Aspirin works by irreversibly binding to COX, the cyclooxygenase enzyme. The COX enzyme is responsible for producing pro-inflammatory prostaglandins and thromboxanes. By reducing production of thromboxane from arachidonic acid, aspirin prevents platelet aggregation – leading to a lower risk of thrombotic events, such as heart attack and stroke. Aspirin acts at two isoenzymes of COX: COX-1 and COX-2. Aspirin works to irreversibly inhibit COX-1 while also altering the enzymatic activity of COX-2. It’s worth mentioning that the anti-thrombotic powers of aspirin only take effect at low doses. Aspirin is associated with its own range of potential side effects. These effects are linked to its mechanism of action. Reye syndrome in children – a syndrome characterized by acute encephalopathy and fatty liver – often fatal. Gastrointestinal side effects – including dyspepsia, stomach bleeding and stomach ulceration. Hypersensitivity reactions – aspirin is known to cause bronchospasm, worsening asthma. High dose aspirin is linked to tinnitus. Aspirin is a well-tolerated drug. Nonetheless, it comes with a range of distinct clinical considerations all students need to know. That the risk of bleeding increases in patients taking an NSAID, alcohol or blood thinner. Older patients are also more likely to experience bleeding than younger patients. That aspirin should be avoided in children under 16; to avoid precipitating Reye syndrome (see above). That aspirin should be avoided in patients who have experienced an allergic reaction to an NSAID – to prevent bronchospasm and other hypersensitivity reactions. That aspirin should be avoided in the last trimester of pregnancy. Aspirin can induce an acute attack of gout. Aspirin should be used with caution in patients with peptic ulceration – aspirin can cause/worsen ulceration and increase the risk of bleeding. Aspirin is typically prescribed at lower doses, such as 75mg, for long-term prevention of thrombotic events (compared to 300-600mg for acute events). Patients with an increased risk of bleeding/peptic ulceration may be concomitantly prescribed a gastroprotective agent, such as the proton-pump inhibitor omeprazole. To minimize gastric irritation, aspirin should be taken after food. Aspirin is an important drug used to treat common symptoms. It also remains an important medicine in the long-term prevention of serious cardiovascular events. For this reason, aspirin remains an important drug in the clinician’s toolkit, perhaps a medicine used for yet another 2,500 years. 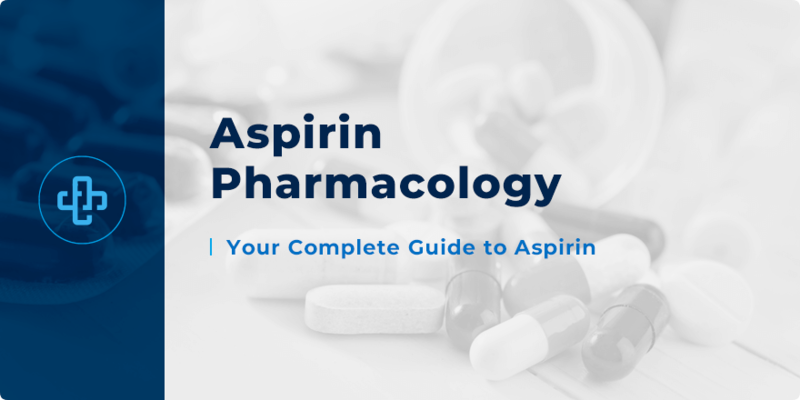 Want to test your knowledge of the pharmacology of aspirin? Register with PharmaFactz today to receive instant access to quiz questions, infographics, flashcards and more. Take a few seconds to join our pharmacy blog newsletter to receive all the latest facts direct to your email!